A tool helping educators generate a theory of action, or an evidence-based story, that explains the specific changes they intend to make to improve teaching and learning. 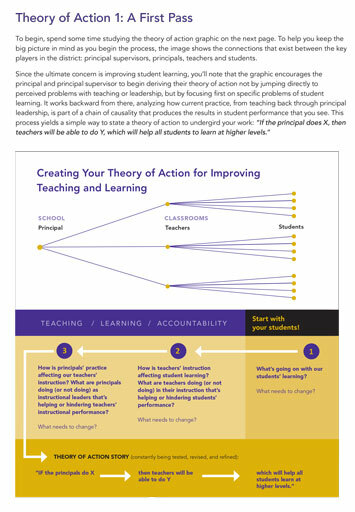 The Creating a Theory of Action Tool helps educators develop a rationale behind the strategies they choose and articulate the thinking behind their decisions. Make your leadership the core of the theory of action. Create an evidence-based rationale for all parts of the theory. Identify the supports needed to make the identified changes in principal practice.